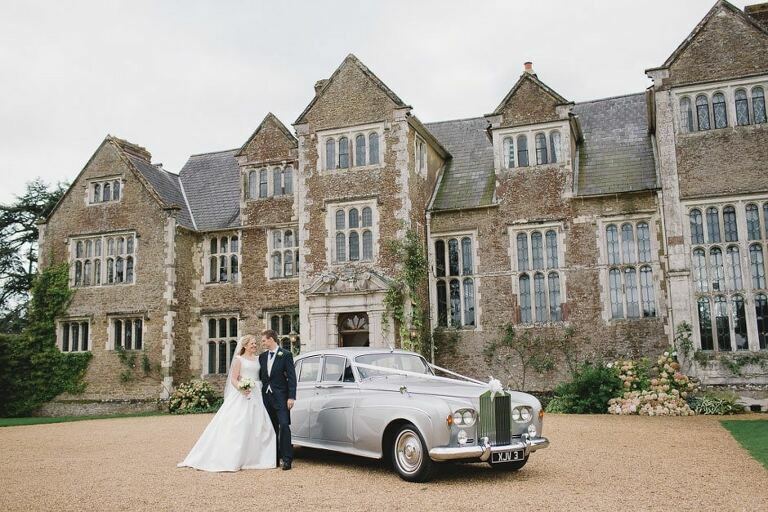 Conveniently located just outside Guildford in the beautiful hamlet of Littleton, Loseley Park in Surrey is a magical setting for an idyllic countryside wedding. The estate, a 16th century manor house surrounded by two and a half acres of beautifully landscaped gardens, combines history, period elegance and stylish design. Enter into the Great Hall with its panelling from Henry VIII’s palace or the King’s and Queen’s bedrooms and you’ll be following in the footsteps of royalty. (James I and Elizabeth 1 were frequent visitors). Similarly, a day spent in Loseley Park transports you into a world of television entertainment and literature as the house and its stunning external grounds have both regularly been used as filming sets for ITV productions. Imagine yourself involved in the plot of a murder mystery or possibly even cast as the leading lady in a period drama, as this is the backdrop for Midsomer Murders, the Agatha Christie ‘Miss Marple’ series as well as Sense and Sensibility and Emma. What a wonderful location to capture a portfolio of unique wedding photography which will be a talking point for years to come! This venue is licenced to hold civil ceremonies and can easily accommodate up to 100 guests. Both the Drawing Room and Great Hall feature original architecture, furniture and portraiture of the era in a classic living room design. The Drawing Room is more suited for the smaller and more intimate occasion, whereas the magnificent grandeur of the Great Hall with its royal portraits and ornate carvings beautifully showcase the character and atmosphere of this historical venue. Alternatively, the 17th Century Tithe Barn, with its ancient oak beams and neutral colour scheme is an ideal space to host ceremonies and receptions. With space for up to 140 guests or up to 400 using additional marquees, the Tithe Barn is an extremely versatile space. Decorate it with your personal wedding colour scheme, add mood lighting to complement the romantic light, airy ambience and you’ll create a magical space – perfect for a wedding reception as well as an evening entertainment venue. Loseley Park’s exclusive catering team can work with you to create a menu of imaginative, freshly produced dishes especially designed to cater for all age groups and special dietary needs. With packages available to suit differing budget constraints, the time consuming worry associated with trying to personally cater for a significant number of guests is immediately eliminated. That’s not only one less thing on your wedding planning ‘to do’ list, but a guarantee that your friends and family will receive a truly first class dining experience. Finally, no wedding day is complete without access to delightful garden finery for those beautiful wedding photographs, and in this respect this venue is second to none. The recently refurbished walled gardens incorporate separate individually themed areas to host your wedding reception refreshments and enjoy the great outdoors. Whether you choose to breathe in the delicate perfumes of the Rose Garden, Flower Garden, White Garden or Herb Garden, take a stroll under the vine walk or explore the maze of hidden corners and paths, the entire estate welcomes you and your guests for an occasion to remember. Loseley Park is a stunning wedding venue, but if it isn’t your cup of tea, or doesn’t fit your requirements then why not take a look at some of other wonderful venues in Surrey I’ve had the privilege of visiting. Address: Stonehill Rd, Lyne, Chertsey KT16 0AP. If you’d like to enquire about my availability for Loseley Park please get in touch here.